Have you noticed the photos that grace the “masthead” at the top of dokotoro.org? We’re using a WordPress feature where it posts a random photo each time you re-load the page. For a long time, we’ve had the same two photos–both of which I love–but I’ve been looking for new ones to add for a while. Our friend and Dokotoro Project volunteer Lyle Hansen has graciously agreed to contribute a few photos for our site. Lyle recently returned from a month in Mali, where he took loads of photos, and visited several projects run by African Sky, our fiscal sponsor. His trip was funded by a successful Kickstarter campaign called Jarabi: C’est la joie de vivre. Please join me in thanking Lyle! 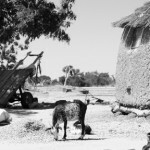 Better yet, go check out his website lylehansen.com for great pictures of everyday life in Mali. A woman removing the skins from peanuts, with a general scene of a Malian courtyard. 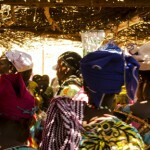 A women’s group holding a literacy class in the village of Zéala. 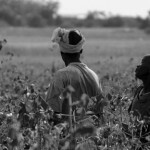 A women’s group hired to pick a cotton field. They are singing to pass the time. Schoolchildren in an amazing new school house built by African Sky. They are practicing French script.